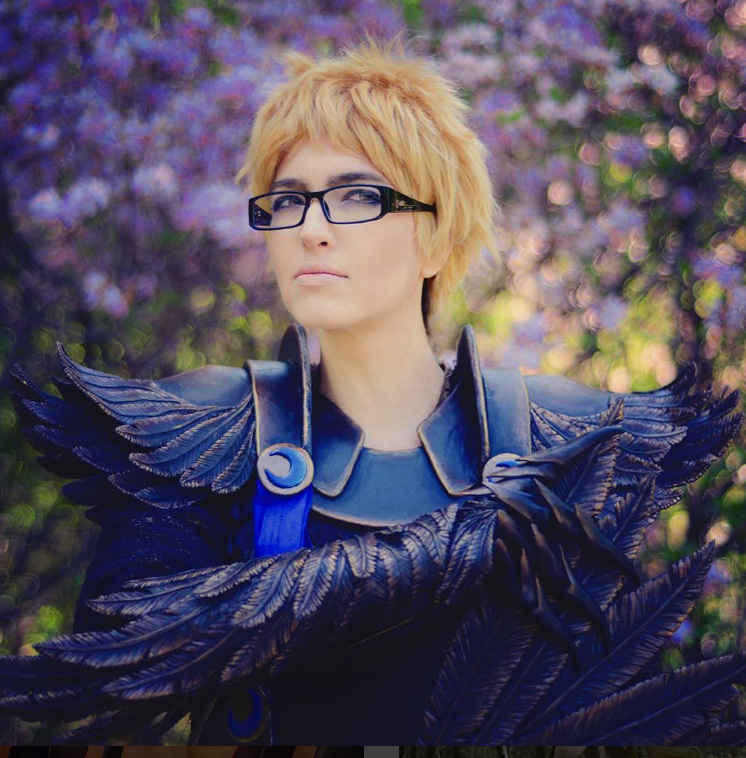 For Tsukki’s Legend of Karasuno cosplay, I decided to go with a heavy crow motif, and what better way to do that than covering myself in feather armor? I ended up crafting close to 100 in total between the shield, gauntlet, and pauldrons, using a few different tweaks for different armor pieces. 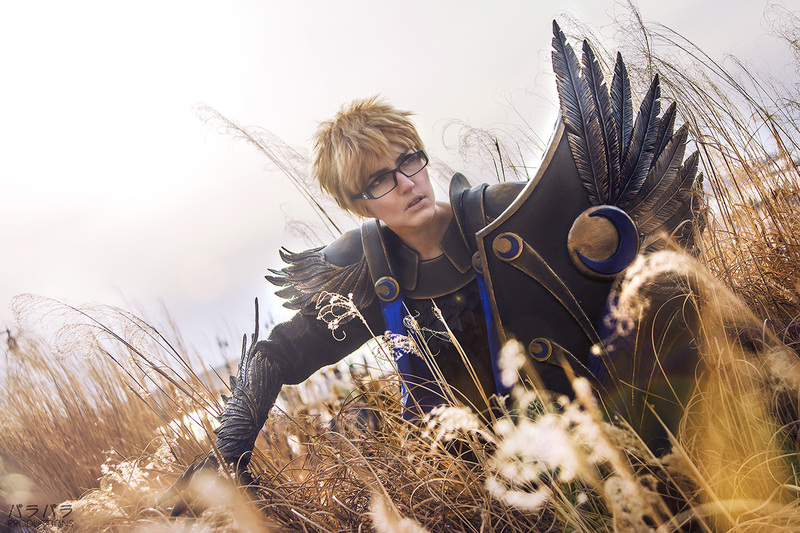 However all of my feathers were made in one of two ways: either by sandwiching worbla around foam for a very thick, large feather, or by stacking two pieces of worbla for a thinner but very sturdy feather that is thick enough to etch deep details into. Read on for these two methods! 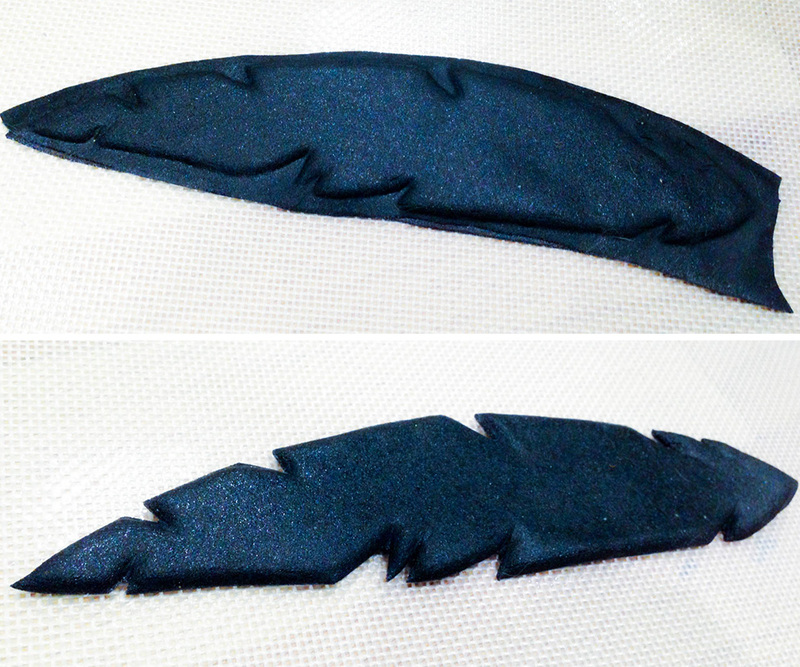 These feathers are rather thick, and made from two pieces of worbla sandwiched around a piece of foam. I only recommend this if you need very large feathers that are not heavily layered, such as the ones on my shield or the longest feathertips on my gauntlet. These do not layer particularly well due to their thickness. However, experiment depending on your own project! 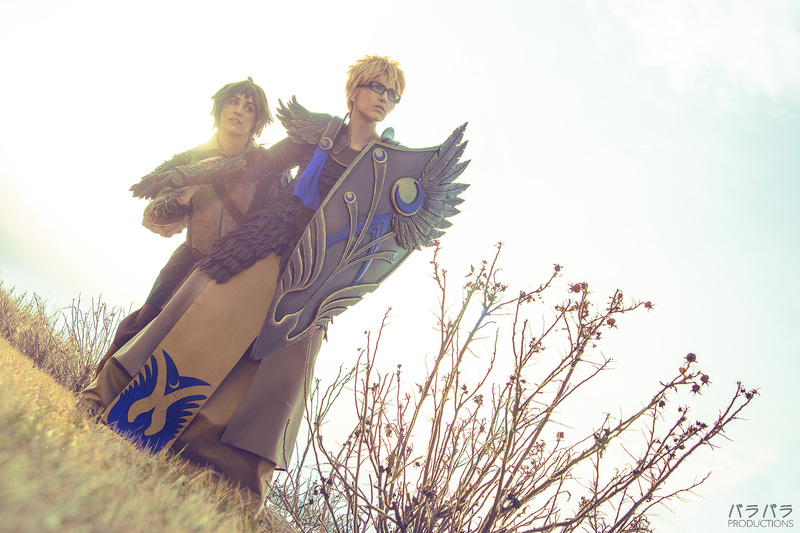 Terieri made wings of three feathers in this fashion, using foam. 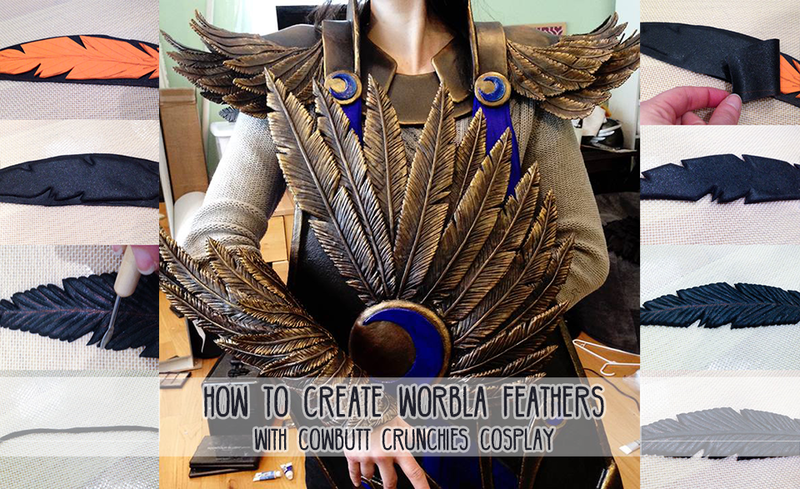 If possible, use worbla black for the top, detailed portion of your feather, and then use worbla mesh for the bottom (or worbla’s finest if you do not have any mesh on hand). I used only worbla black for some feathers and it was noticeably less “sticky” than either mesh or finest, to the point where I had some difficulty with my sandwich popping apart in places. If using just worbla black, make sure that you apply a high amount of heat before pressing your sandwich edges together. Worbla mesh is a fantastic sandwich backer due to its very sticky nature, and also adds extra stability to prevent breakage if you cut your feather ticks particularly deep. 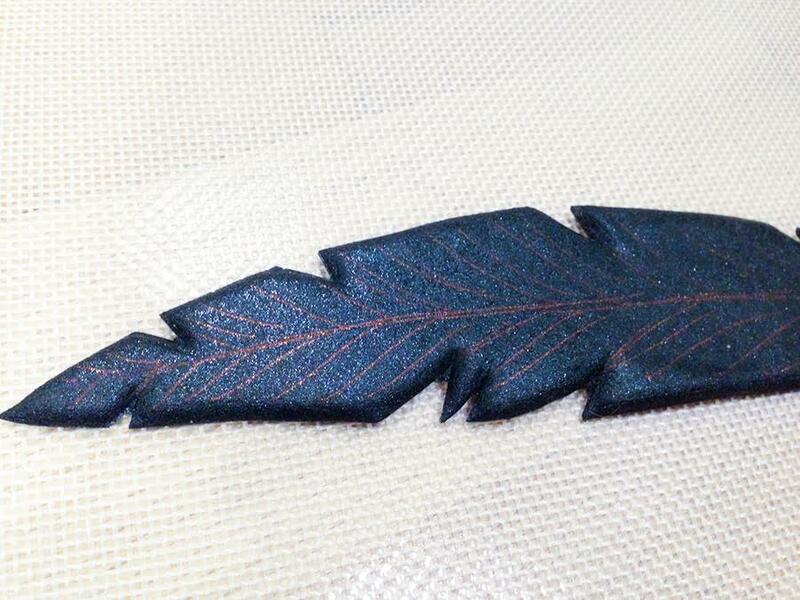 1) Trace your feather shape onto a piece of 2mm or 3mm thick craft foam. If you’re a fan of “ticks” or gaps in the feather, be sure to add these as well. Cut the entire feather out, and clip the ticks with the nose of your scissors. 2) Cut out a piece of black worbla and mesh worbla that is a bit larger than your foam template. Heat both of these pieces thoroughly until they are nice and floppy. 3) Place your mesh worbla smooth side down onto your silicone mat. Place your foam feather on top and then place your black worbla over that. 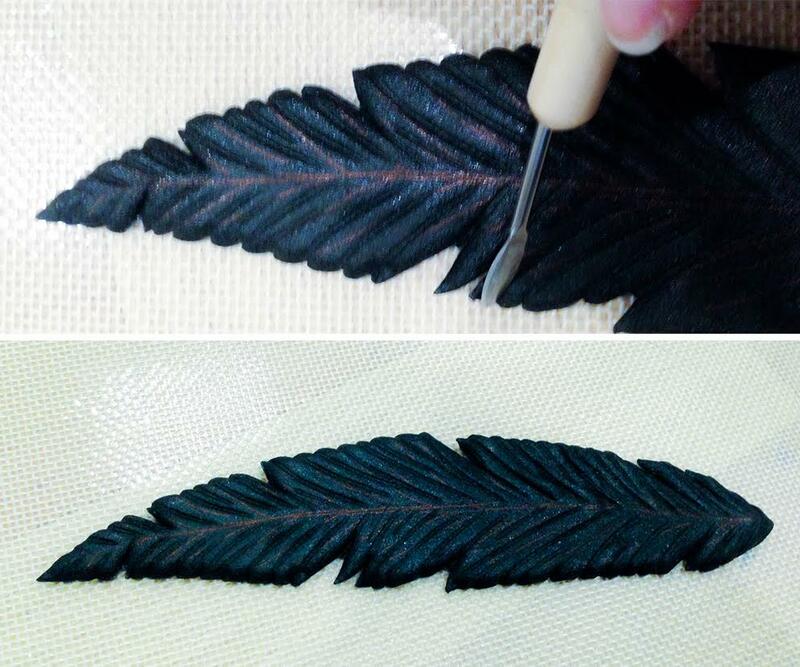 Being careful not to trap any air, use your fingers to thoroughly press your black worbla into the mesh worbla all along the edges of the foam, including the tick marks. If your worbla begins to cool too much, just heat it up again but try to concentrate that heat along the edges if you can. 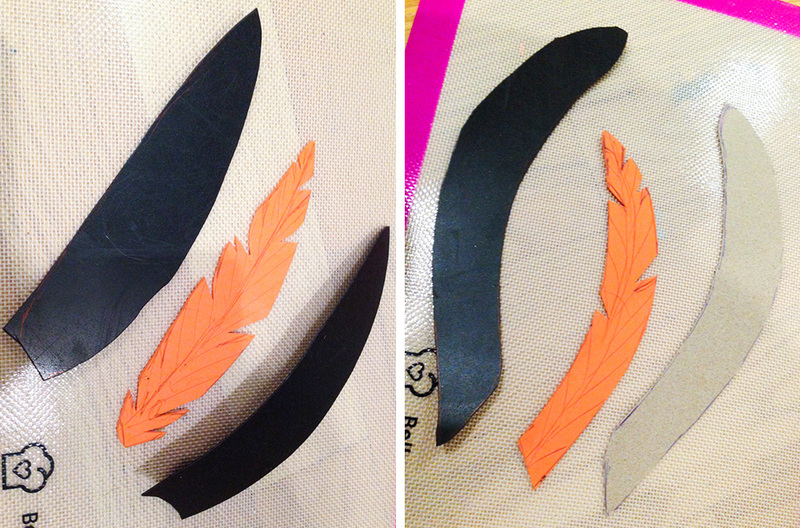 4) While the worbla is still somewhat soft, use your scissors to cut around the edge of the feather. Take care not to leave a few milimeters between the foam itself and your scissors – you don’t want to accidently cut into the foam itself. Use the nose of your scissors to also cut away the excess worbla in your tick marks. 1) Start by tracing your feather pattern out of paper for use later. For my feathers I included a few “tick” areas that will look to be gaps. I found that it helped make my feathers look a bit more realistic. 2) Cut out two pieces of worbla that are a bit larger than your pattern. Use your heat gun to thoroughly heat both pieces, and then lay them on top of each other. Take care that you don’t accidently trap any air between the sheets, and then press the pieces together. 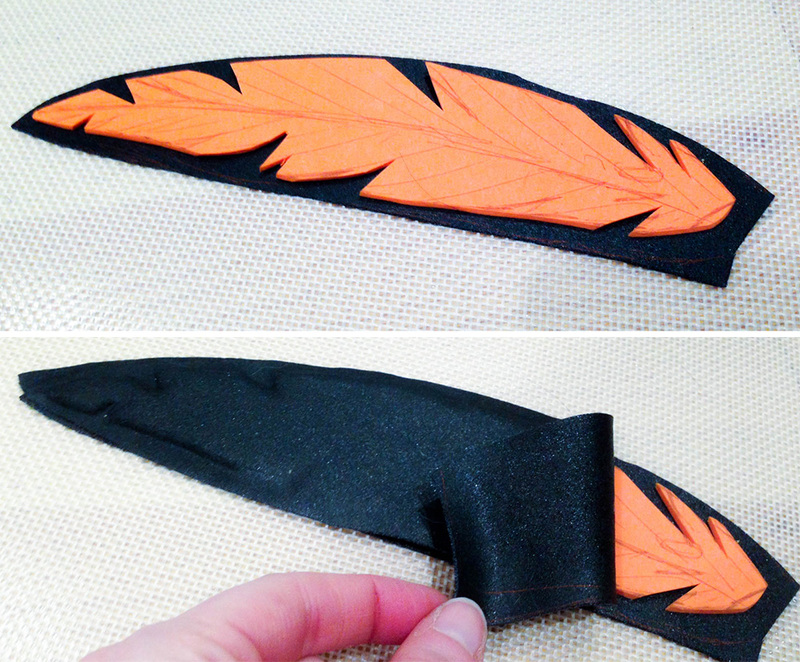 3) Trace your feather pattern onto the worbla. Re-heat the worbla once again until it is soft enough to easily cut, and then cut your feather shape from the plastic. Use the tips of your scissors to snip out the tick areas. Now that your base is finished, it’s time to etch in a few details. Remember that there’s no one right way to do this – you can go as cartoony or realistic as you like. 1) Use your pen to draw a line down the center of the feather where the quill will lay. Next, sketch several lines running from the quill, upward toward the edge of the feather. You may not find these steps necessary once you become a feather expert, but at first I found them very helpful when needing to know where to press my tool in the next step. 2) Heat your feather again to make it a bit soft. 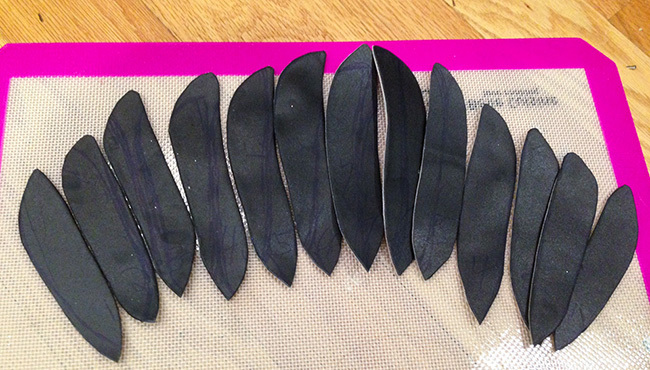 Use your clay tool to begin etching lines in your feather, from the quill to the edge. I like my feathers a little cartoony, but you can always clump these lines closer together and make them lighter for a more realistic look. If your feather starts to harden again, don’t worry – hit it with your heatgun again until it softens up. I usually have to re-heat once or twice per feather. 3) This step is optional, but I really liked the semi-cartoony, semi-realistic look this extra step gives. Once all of your lines are etched, use your clay tool to press inward on the edge, at either every or every other etch line. 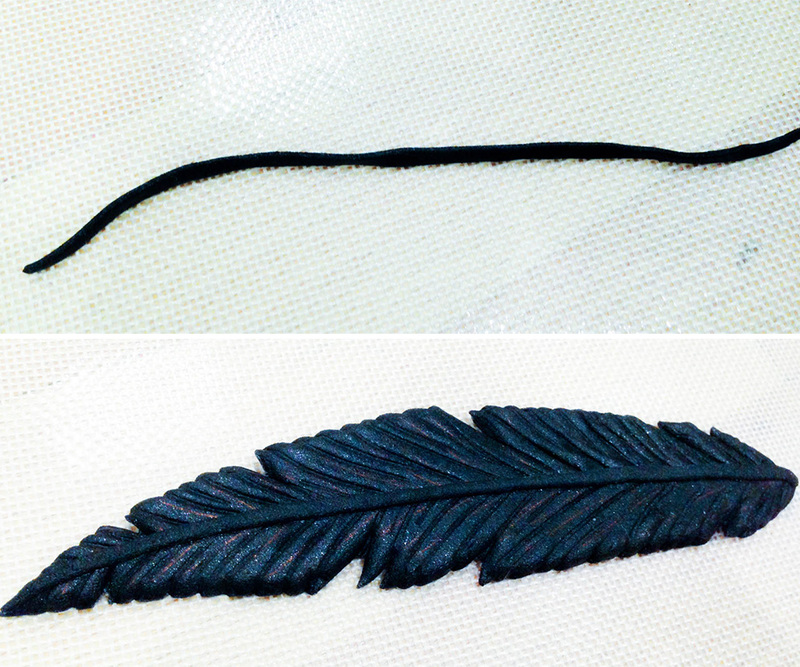 4) Cut a skinny strip of worbla around the length of your feather. Heat it with your heatgun and then roll it until you’ve created a very thin noodle. Heat both the noodle and your feather one more time and then press the noodle down the center to form the quill. Rejoyce in your glorious birbness!